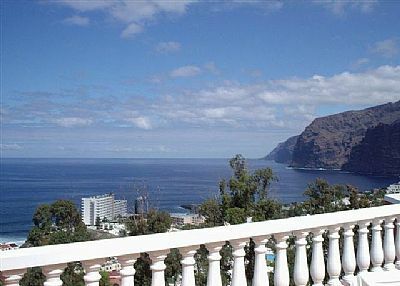 This is apartment to rent in Colonial Park, Los Gigantes has stunning sea views from the sunny balcony. 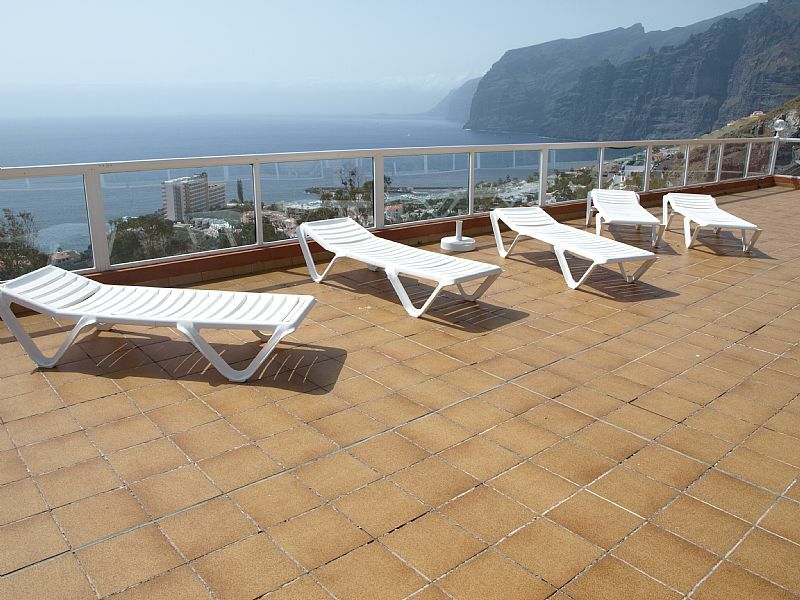 These stunning apartments to rent in Colonial Park, Los Gigantes have lovely views. 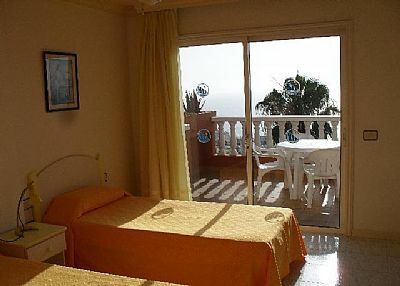 Set in one of the best positions in Los Gigantes with panoramic views over the whole resort, marina, cliffs and sea. You can sit for hours just enjoying the view! 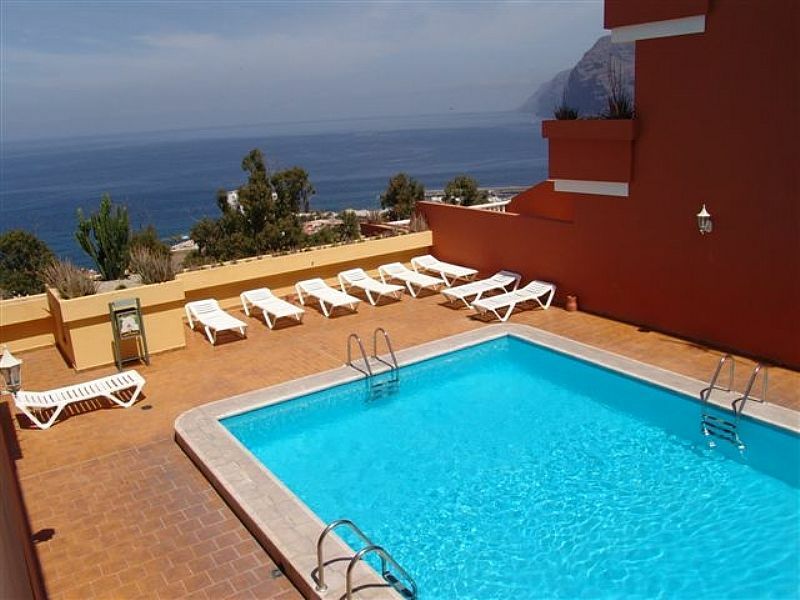 The complex has a gorgeous pool with stunning views and plenty of sun beds. Above the pool is a roof top solarium with glass walls so the views can still be enjoyed. Whether by the pool or on the roof, sun worshippers will love Colonial Park and the wonderful views that can be enjoyed. 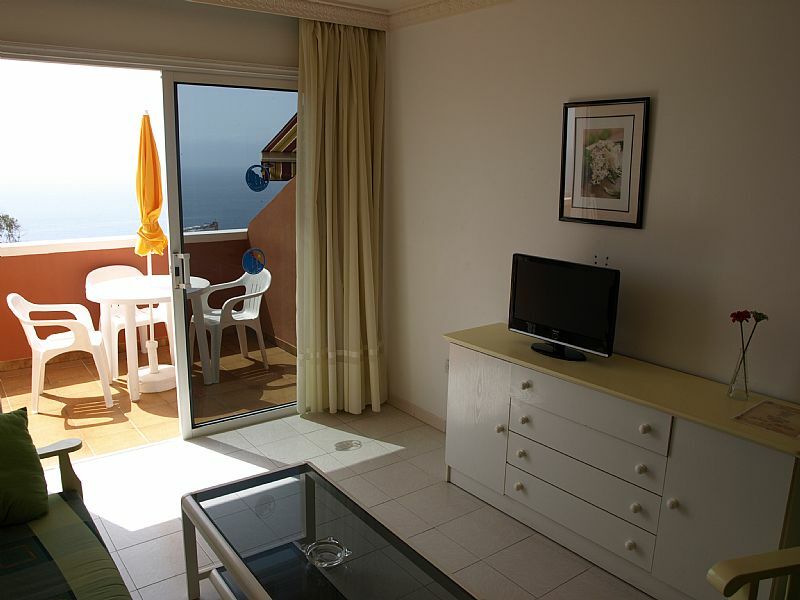 Twin Beds, Chest of Drawers, Fitted Wardrobes, patio doors leading to balcony and wonderful views. Hob, Microwave, Fridge (freezer compartment), Electric Kettle, Toaster, washing machine. 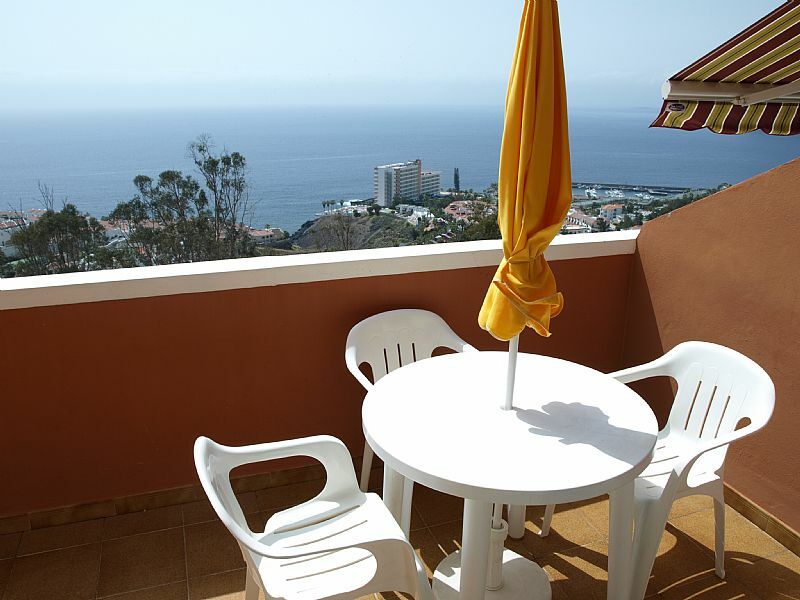 South facing sunny balcony with wonderful panoramic sea views, Sun chairs, Patio table. 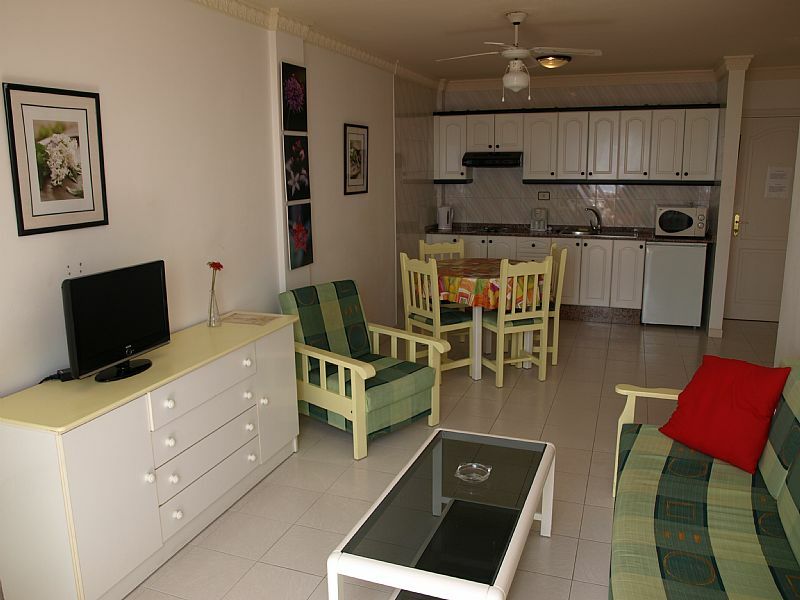 Colonial Park is an apart-hotel with many privately owned apartments. Please note that each apartment can differ in in nature, size and contents, as can the balcony. Therefore the above description is a general overview. 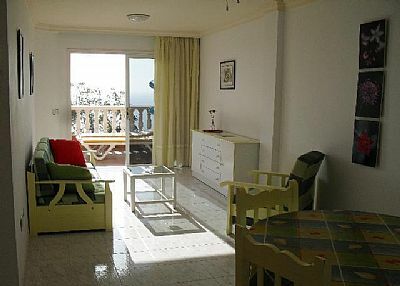 Gorgeous pool with sea views, Roof top solarium, pool, Italian restaurant adjoined to the complex. Free wi-fi in Italian restaurant if you want to bring a laptop. The complex is adjacent to a row of shops / quiet restaurants. 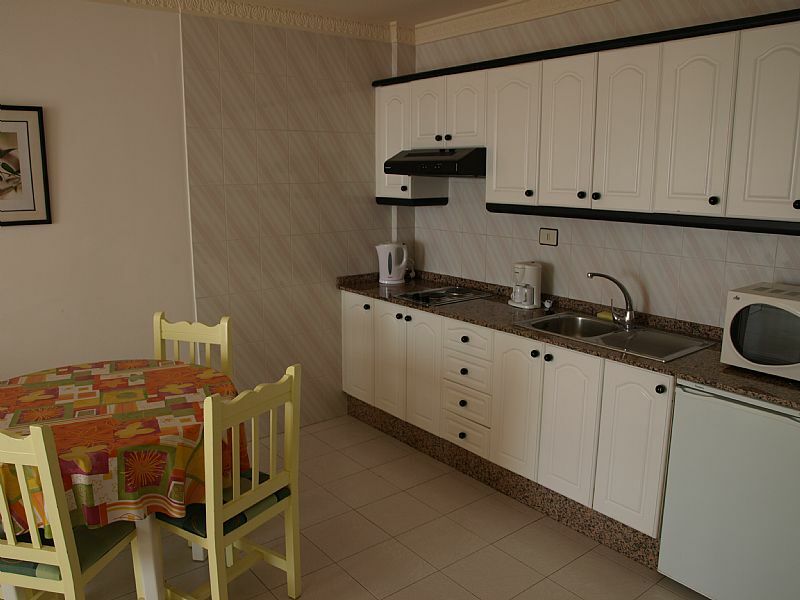 40 minutes from Airport (Private transfers can be provided), 15 mins walk into resort centre. Los Gigantes was declared a place of National Tourist Importance and since then has been developed in a tasteful way, not loosing the village effect that makes it that much more attractive, and it is the closest town to all the National Parks. 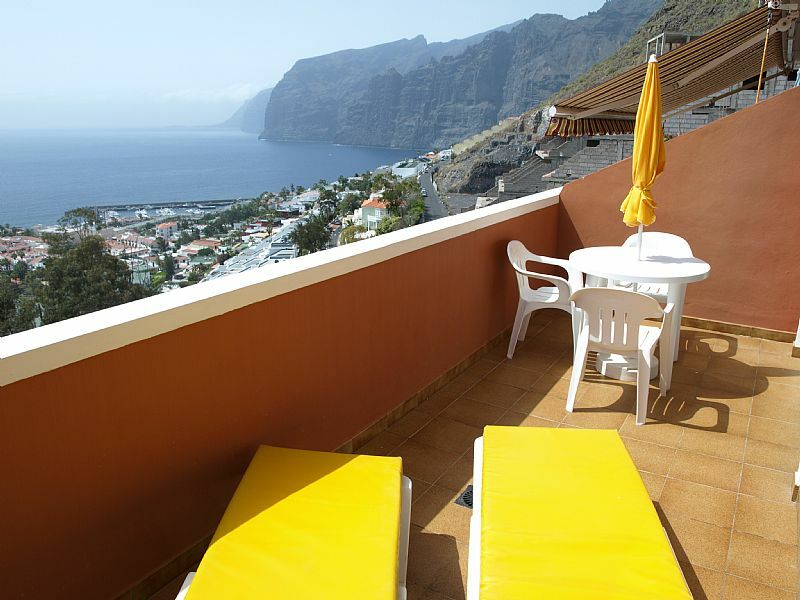 The name Los Gigantes, is derived from the magnificent cliffs that rise up dominating the view across the picturesque harbour. 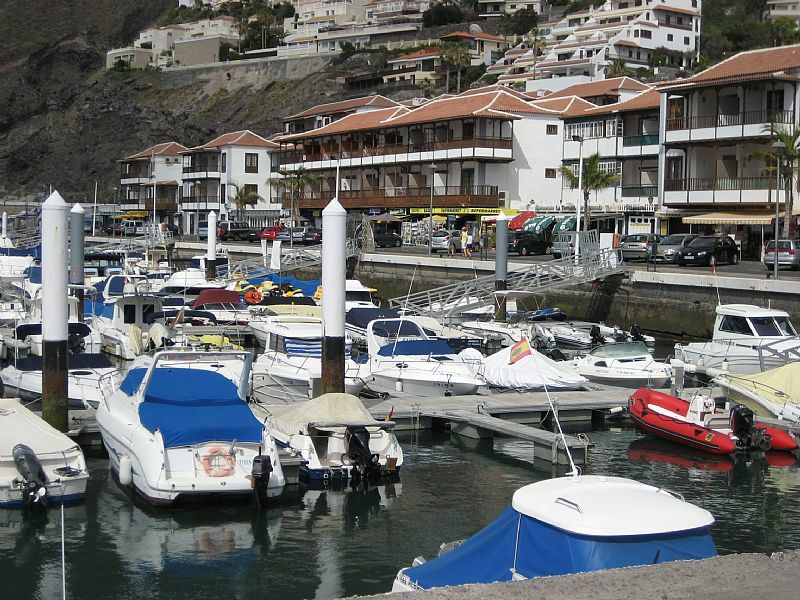 The Marina has a variety of bars, restaurants, water activies such us dolphin and whale trips, fishing, boat hire, scuba diving etc. 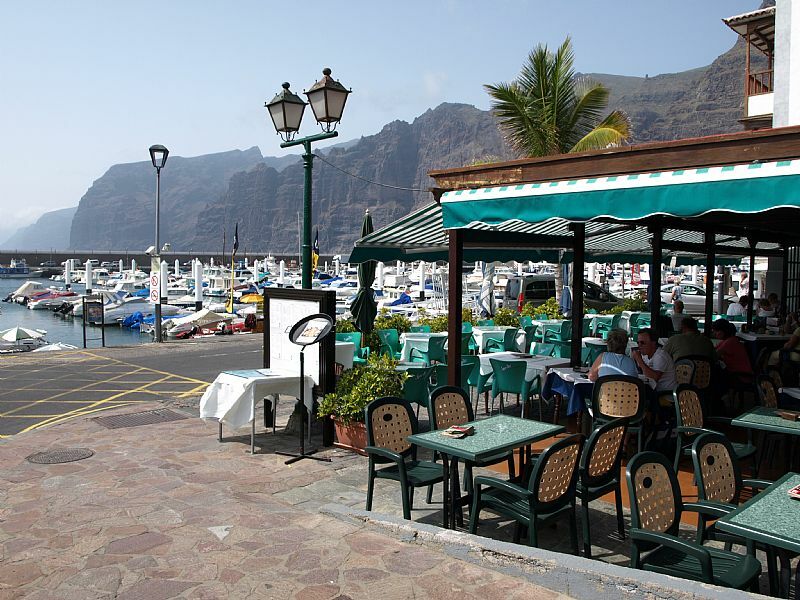 Colonial Park is a 15 min walk to the centre of Los Gigantes village where many bars, restaurants and boutigues can be found. Beyond that is the marina and the lovely beach, all lined with restaurants. 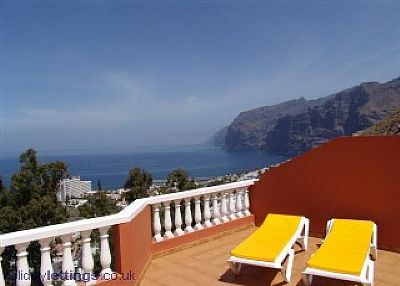 Please note Los Gigantes enjoys a cliffside location so holidaymakers should expect hills. 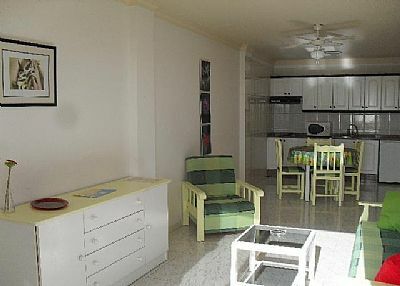 As described, this is a spacious apartment with a super large terrace and great views. The lounge and kitchen area are quite acceptable if not a little dated. The bathroom, however is in need of an update and the hot water tank is not really big enough for 2 consecutive showers. The towels have seen better days, even the white towels looked grey. The twin beds were comfortable but sadly no Duvet, just old fashioned blankets. This apartment has huge potential and could very easily be updated to a luxury unit. We hope the owners take this on board. Thank you for the review. The bathroom will be updated this year. We will purchase new towels. We want our clients to have the best experience possible in the apartment. Not only to enjoy the breath-taking views from the huge terrace but also to feel as comfortable as possible too. We appreciate your feedback and will act on it.